It's been two years since Hugh Grant's last film, but he's returned to the big screen — opposite Sarah Jessica Parker — in "Did You Hear About the Morgans?" "On the last film I did, 'Music and Lyrics,' although I really enjoyed it and I liked the film, I did get terrible panic attacks," he says. "And I sort of thought after that 'I'm not keen to have more panic attacks,' so that kept me away." Grant, whose screen credits also include "Notting Hill" and "Four Weddings and a Funeral," says he was pleased to again work with Marc Lawrence, his director on "Two Weeks Notice" and "Music and Lyrics." "I like the idea of being out in the Wild West. I love shooting on location, it's much more fun, and the whole dynamic of the character, of a guy who spends half the film trying to unfrost a woman, and I understand that dynamic," the 49-year-old actor says. "She's a laugh," Grant says of his co-star. "She's eccentric and very funny, weird sensibility. Very surprising things with Sarah Jessica, like the amount that she eats or the interest she takes in food, gigantic for a woman who's tiny. I've never seen a woman eat that much or that voraciously. She's like a locust." Grant says he gets involved in script development, casting and editing of movies — even the selection of the poster. "But the one part that is probably my least favorite is the acting," he says. "I did it as a joke job for a year after I left university," he says. "And I was so bad in the first things I did, I thought, 'I've got to do another job to prove that I'm not quite that bad.' And that's gone on for 27 years now." "Did You Hear About the Morgans?" opens in U.S. theaters Friday. 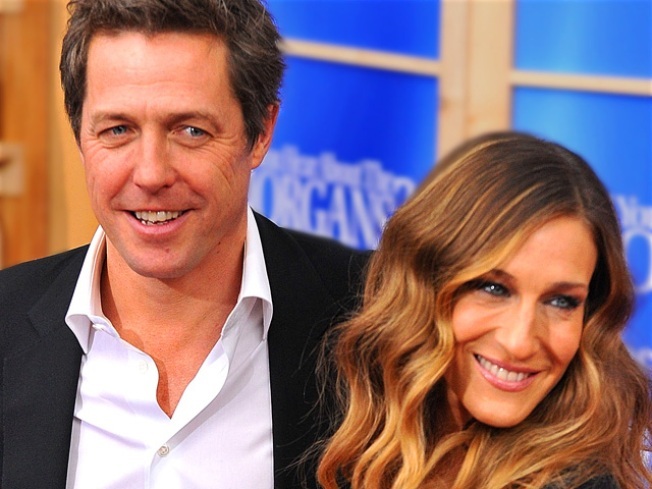 MORE ACCESS ON THESE TOPICS: Hugh Grant - Weddings - Music - Sarah Jessica Parker - Did You Hear About The Morgans?